Agricultural Economic Insights Does U.S. Yield Potential Vary With State Acres? 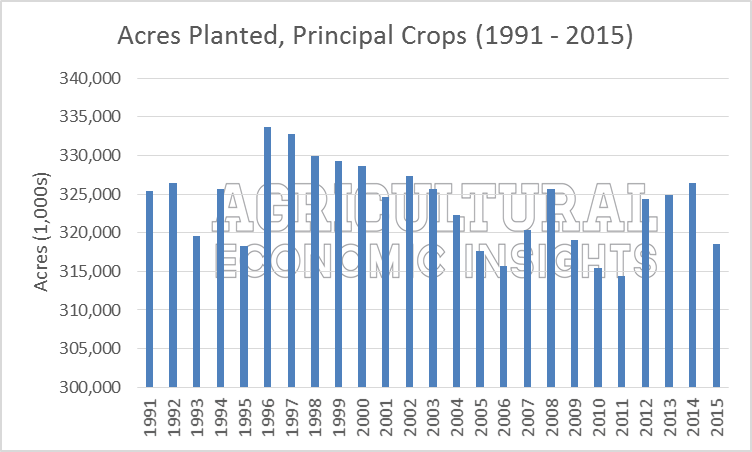 In thinking about the implication of the USDA’s March 2016 Prospective Plantings report, many have noted the strong increase in corn acres in the central plains states. In fact, we noted in our earlier post that Kansas, Nebraska, North Dakota, Oklahoma, South Dakota, and Texas accounted for 40% of the anticipated 5.6 million additional acres of corn in 2016. Since the USDA’s report, we have wondered about the potential implications that so many additional central plains acres might have on overall U.S yield potential. Specifically, would the additional corn acres in the lower yielding central plains states limit, or be a drag on the average U.S. yield? This week’s post takes a look at the data to see what can be said. To dig into this, we took a look at how the U.S. weighted average yield varies as state acres shift. Or to put another way, does the national corn yield “average” vary as state’s account for a larger (or smaller) share of total acres? The first step in doing this was estimating the trend-adjusted yields for each state and calculating the state mean yields from 2000 to 2015. Second, for each year (2000-2015) the state mean yield was multiplied by the corresponding annual share of total acres. The sum of weighted yields across all states provides the U.S. average yield weighted by state acres. To clarify, the only variable changing from year to year are state acres; specific state average (trend-adjusted) yields were kept constant. Do Weighted Corn Yields Vary? In figure 1 the state-weighted U.S. trend adjusted corn yields from 2000 to 2015 are shown. At first glance, one can notice that from year to year, the U.S. average yield – when weighted up from state level data – varies as the allocation of state corn acres varies. 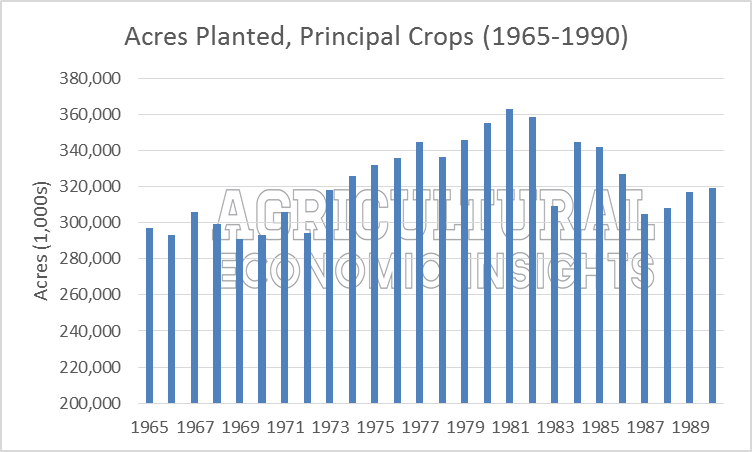 From 2000 to 2005, the distribution of corn acres resulted in higher average yields whereas the distribution of corn acres in recent years has resulted in lower annual weighted-average yield. Across the data series, the mean of state-weighted US average yield was 162.1 bushels per acre (illustrated in black). Intuitively, this trend makes sense as strong prices signaled an expansion of corn acres in lower yielding states of the Western Corn Belt. While the U.S. yield weighted average varies over time, take careful note of how small these changes are. All of the values fall between 161 bpa and 163 bpa. 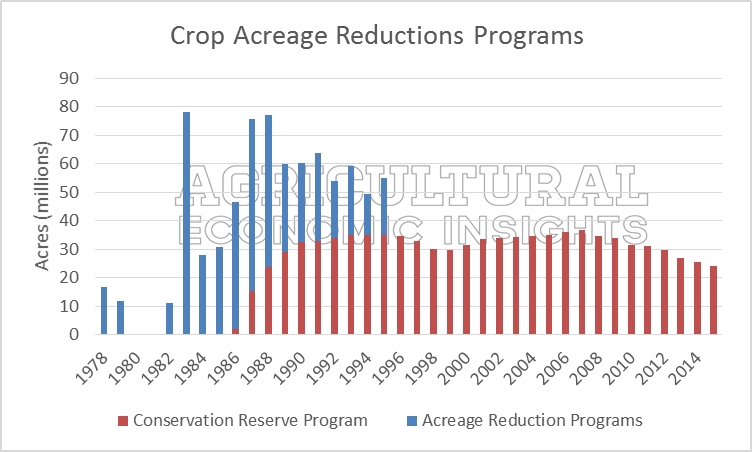 Specifically, the spread between the highest weighted average (162.7 bpa in 2001) and lowest (161.3 bpa in 2013) was only 1.5 bushels per acre, or 1% of the average. So while distribution of corn acres across states impacts the overall US weighted average yield from year to year, the impacts are very small and likely irrelevant. Much smaller than we, and likely others, expected. In thinking about why weighted average corn yields vary so little from year to year, it’s important to think about the overall allocation of corn acres. In 2015, Illinois, Iowa, Minnesota and Nebraska (the Big Four) accounted for 48.5% of total corn acres. Even with the large shifts in corn acres expected by the USDA in 2016, these states will together account for 47.0% of the 2016 corn acres. For the weighted average corn yields to vary greatly, the allocation of acres must vary greatly. To further show how consistent the distribution of corn acres are, the share of total corn acres accounted for by Illinois, Iowa, Minnesota, and Nebraska is shown in figure 2. These four states account for nearly the same share of total corn acres each year. Illinois and Iowa have shown the most variation over time. Illinois, for example, accounted for as much as 14.8% of the total acres in 2005 to as few as 12.6% in 2013. Figure 2. Share of Total U.S. Corn Acres Accounted for by Illinois, Iowa, Minnesota, and Nebraska (2000-2016). We also thought it would be interesting to look at soybeans. Using the same method, we found a similar result (Figure 3). Overall, yield potential varies, but the change is very small and similarly insignificant. The spread between the highest potential (45.4 bpa in 2001) and lowest (44.3 bpa in 2014) was 1.1 bushels per acre, or 2.5% of the series average (44.8 bpa). Interestingly, soybean are more impacted by the distribution of acres than corn (variation of 2.5% of mean for soybeans compared to 1% of mean for corn). Figure 3. U.S. Weighted Average Soybean Yield, by State Acres (2000 – 2016). Data Source: USDA NASS. Given the distribution of corn acres shifts so little from year to year (figure 2), little impacts on the weighted average U.S. corn yield are found (figure 1). While mathematically these values change from year to year, the variation is very small. The story is very similar with soybeans. In short, it is difficult to argue that the location of the additional U.S. corn acres, specifically those in the central plains, tell us much new about the expected magnitude of the 2016 U.S. corn and soybean yield potential. At the end of the day, there are a lot of acres and the overall distribution doesn’t vary much from year to year. As one might expect, growing conditions in the major corn producing areas will ultimately be the biggest driver of yields.